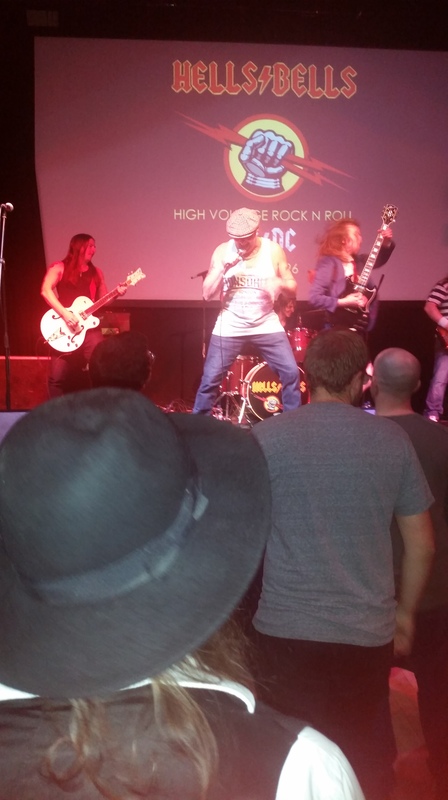 Most of you have probably guessed that the reason why I am writing about AC/DC’s 1985 “Fly on the Wall” album is because tribute band Hell’s Bells came to town. I know I’m being predictable but who cares? 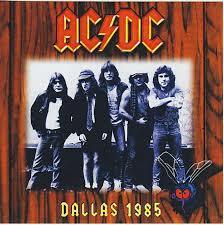 Seeing Hell’s Bells gives me great motivation when writing about AC/DC albums, especially when the band didn’t play any songs off this album. 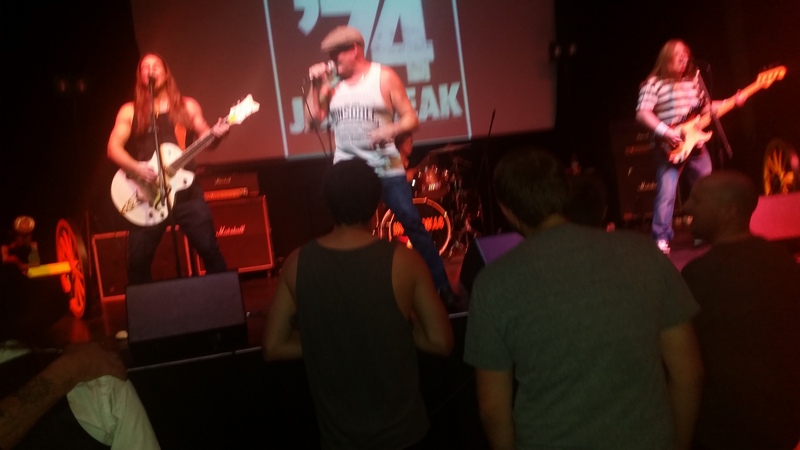 Saying that, they may do so next time they come because this time, they played a song from the “74 Jailbreak” album which I posted about last time. They played “Jailbreak” as well as many other great songs. The great thing is that Hell’s Bells always mix up their selection of songs so you don’t get the same ones all the time. Yes, they played many of the classics, “Back in Black,” “You Shook Me All Night Long,” “Highway to Hell,” “TNT” and “Whole Lotta Rosie” but they played others as well. “Thunderstruck,” “Shoot to Thrill” “Let There Be Rock” and “Hell Ain’t a Bad Place to Be” were played to the crowd in Stroud. The only unfortunate moment was that the band had brought two canons in order to play “For Those About to Rock, We Salute You” but the venue wouldn’t allow it. 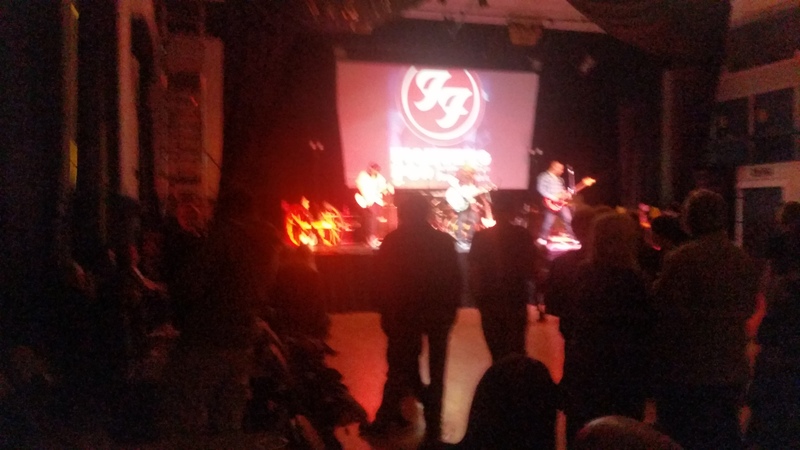 Anyway, this was probably Hell’s Bells’ best performance and I have to say I was quite impressed with support act, Foo Fighters tribute band, Fighters Foo. If you remember, last time they played under the name Pity the Foo but the lead singer announced that they had to change the name for political reasons. 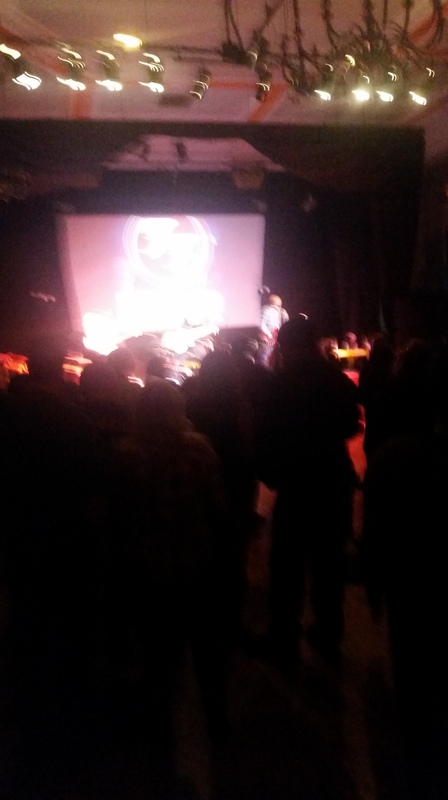 It was a great evening and what I found most amusing was that the venue was packed while the trendy pub nearby having their Halloween party was dead. I guess Hell’s Bells were the bigger draw. A better shot of them. BTW, I have come into modern times with an up to date mobile phone. AC/DC will go on forever. 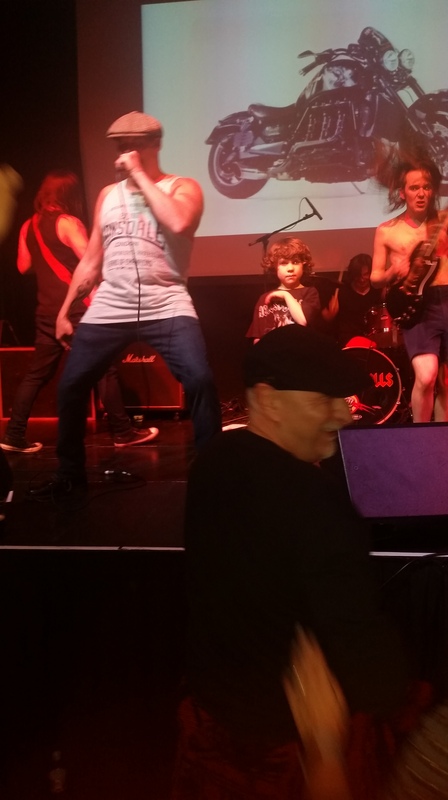 I thought it was great that the band brought this boy up on stage. 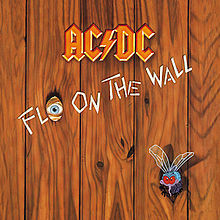 It has been said in many circles that “Fly On the Wall” was probably AC/DC’s worst album. For many years, I thought it true about “Flick of the Switch” but recently, after listening to both, I have come to the conclusion that someone must have put acid in my drink back in 1983 because I don’t find that the case any more. Still, I don’t know if I would now call “Fly on the Wall” their worst album because I thought it was okay, just okay back then and even today, it has its moments. Sure, there are tracks on the album which I would agree sound a bit of a dirge, a term I’ve heard other bloggers use to describe the album but there are still some good tracks on the album and those are the ones I’ll focus on. The title track starts things off on the album and the sound of the fly buzzing around in the background during it makes no difference to the song for me. It doesn’t make it sound amusing nor does it detract from it. It’s just a decent song. The next track is the best one on the album. “Shake Your Foundations” takes me back to the glory days of the “Back in Black” era. AC/DC put everything that made them who they are into this song and it shows. “Danger” comes a real close second and although lead singer Brian Johnson has been criticized for mumbling on “Fly on the Wall,” his vocals come through quite clear and well on this track. “Sink the Pink” is also a very good track and I have to include “Stand Up” among the best tracks here. What you get with “Fly on the Wall” is half a great album and half filler tracks but even the filler tracks aren’t that bad so overall, it’s a good album. Not only did “Fly on the Wall” receive mixed reviews at best from the critics and fans, they would also run into difficulties in another way in 1985 when a mass murderer claims he was influenced by their song “Night Prowler” to commit his crimes. This led the religious zealots in America to go after the band and call them Satanic. 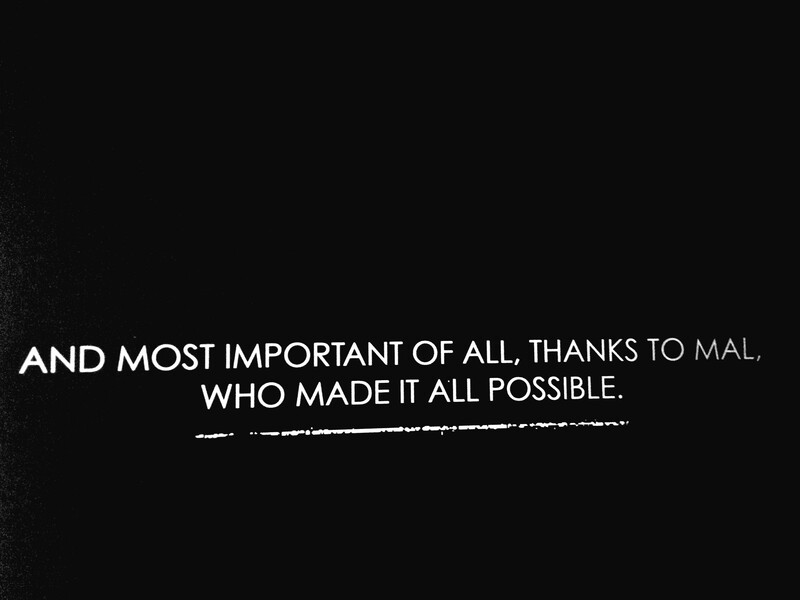 In spite of that, AC/DC continue to remain in the hearts of many millions of fans to this day. My favourite member of the best rock band there has ever been has died today. Rock in Peace.